What does what you believe have to do with the soulmate experience? It’s difficult to have an extraordinary relationship when your mind is cluttered with less-than-extraordinary beliefs. If you believe in lack, you’ll see lack wherever you look. If you believe in abundance, you’ll see abundance. Although it’s possible to have a relationship with any set of beliefs, every limiting belief and inflexible position we hold will reduce our potential for a soulmate experience. Changing or letting go of beliefs and positions that aren’t working for you will go a long way toward making you available for the enlightened relationship you desire. This is true both before you enter a relationship and when you’re in one. First, raising the quality of the beliefs you hold about yourself will automatically raise your sense of self-worth. This is especially important to understand before you get into a new relationship. People with low self-worth tend to attract partners who also have low self-worth—and possibly even partners who will eventually turn to abusive behavior in order to try to feel in control. The more you raise your self-worth, the higher the quality of the potential partners you will attract. Second, when you’re in a relationship, having flexibility about what you believe will be very useful when it comes to keeping your relationship vibrant and alive. Learning how to change or let go of your beliefs when they aren’t serving you and your relationship will enable you to respond fluidly to—and make the most of—the challenges you are bound to encounter. What are the chances of having a truly connected experience with another human being if we go around with beliefs like these? In fact, one way to identify your core beliefs about relationships is to look at the similarities among the relationships you’ve had in the past. Excerpted with permission from The Soulmate Experience: A Practical Guide to Creating Extraordinary Relationships by Mali Apple and Joe Dunn. This bestselling book won a 2012 International Book Awards gold medal and a 2012 Living Now Awards silver medal. Mali and Joe are currently deep in the creation process of the second book in “The Soulmate Experience” series, The Soulmate Lover. This reminds me of the quote from Pollyanna — If you look for the bad in mankind expecting to find it, you surely will. Yes, I remember that line and how true it is. 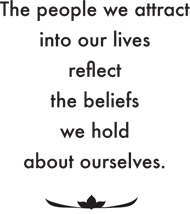 So often we do allow our thoughts and beliefs to take over. Mali and Joe’s book, where this excerpt was taken from is super!